Eric’s work receives the highest praise from the most critical eyes in publishing: Kirkus kindness, School Library Journal starred reviews, a Caldecott medal and honor, and more. Although the awards are plentiful, Eric measures his success in the responses he gets from children. That’s my guy at age two. He loved reading My Friend Rabbit every morning in his secret spot. I love the way he turns the book at the end and the sound of surprise in his voice, though he’d “read” the book a hundred times before. It proves Eric’s theory about children inhabiting books. In holding that book, my son became part of Rabbit’s story. 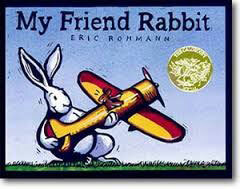 Rohmann crafted My Friend Rabbit with surprising page turns, animals facing this way and that, a line to trace the flight of the plane– all considerations for his young readers. He always creates books that his fans can inhabit. From My Friend Rabbit to Bone Dog to Oh!No! we are pulled from our seats and into his illustrated world. I had the chance to chat with Eric about his books and his upcoming workshop at the Foundation, Carving Out Your Picture Book for Submission. Author Candy Fleming, editor Mary Colgan and art director Maria Middleton will all join Eric for the workshop. Alison: Welcome, Eric! We are thrilled to have you on the blog today. Can you tell us a bit about what is happening in your studio today? Eric: Candy Fleming and I have two books on the way and neither is anything like the other. Bulldozer Helps Out is the further adventures of the construction trucks we met in Bulldozer’s Big Day. This time, we encounter some new characters and Bulldozer solves a tricky problem. The second book is a nonfiction picture book called Giant Squid. The book is a departure for us, as I made the storyboard first [and] handed it to Candy, who wrote and then handed it back to me. I altered the storyboard and then gave it back to her — so that after a give-and-take, we arrived at a finished book unlike anything we have done. So begins Eric and Candy’s Fall 2016 release, Giant Squid. 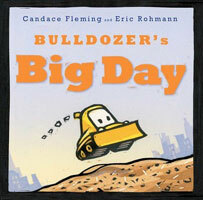 Alison: Another Bulldozer book? Yes, please. I read a post on Candy’s blog that included the beginning to Giant Squid. 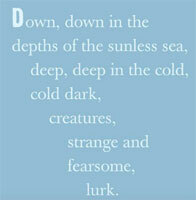 “…strange and fearsome…” I can’t wait to see the illustrations that prompted this phrase. It is always inspiring to hear about collaborations like yours with Candy. What about you? What inspires or influences your work? Mentors? Books? Eric: There have been many people who have influenced and inspired me. I don’t have a singular mentor, but I think that all the books [and] all the pictures I have seen over the years have been my classrooms. I learned over time that the best mentor is curiosity. Recent books that have caught my eye: Waiting by Kevin Henkes, The Night World by Mordicai Gerstein, It’s Only Stanley by Jon Agee. Really anything by Mo Willems, Sophie Blackall, Paul Zelinsky, Matt Cordell, Larry Day, Tom Lichtenheld, Chris Sheban, Marla Frazee … plus about a hundred more we can talk about over lunch when I am out at The Barn. Alison: Good books are always a hot topic over meals at The Barn. Speaking of your visit to The Barn, I’ve heard rumors that you will be carving during the workshop? Please tell us more. What do you plan on carving? Eric: We will all be cooking a turkey – cooking and carving a turkey. Okay, “cooking a turkey” is actually a metaphor for making art. 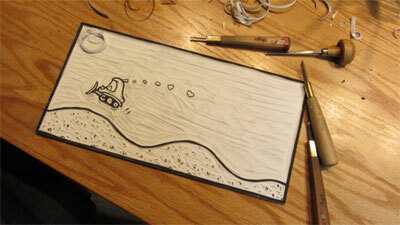 Many of my books are made with relief prints, so we will give this way of making a picture a go. Black line printing plate from Bulldozer’s Big Day. Alison: Oh, that kind of carving. Then why did you ask us to order 100 large pumpkins? Alison: Thank you for your time today, Eric. We are all looking forward to solving the great pumpkin mystery this fall. Eric: See you in October!